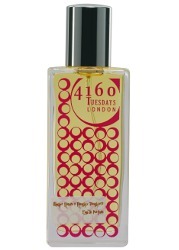 Indie brand 4160Tuesdays will launch Mother Nature's Naughty Daughters, a new chypre perfume, next week. 4160 Tuesdays’ latest eau de parfum, Mother Nature’s Naughty Daughters, is a rich chypre with lashings of tasty praline, rose, broom and berries on a bed of cedarmoss. Perfumer Sarah McCartney has composed a classically structured scent that blends some of Mother Nature’s bountiful offerings with gorgeous 21st century materials, and modern safe synthetics. It’s a perfume that celebrates science collaborating with nature. The fragrance is named Mother Nature’s Naughty Daughters after the naturals – rose, cedarmoss, opoponax and broom - which perfumers can only use in small amounts. That’s not only because of the expense, but because naturals are more unpredictable on the skin than modern safe synthetics. It contains technically natural blends that smell just like pear and strawberry, but are constructed from other plant materials. The natural hazelnut is produced by critical CO2 extraction. Even the rich blackcurrant you can smell in Mother Nature’s Naughty Daughters is a perfume illusion created by combining other fruits. Additional notes include malt, ambergris and cedar. 4160Tuesdays Mother Nature's Naughty Daughters will be available in 9, 30, 50 and 100 ml Eau de Parfum. Terrific name! I’ve been underimpressed by three out of the four 4160 Tuesdays scents I’ve tried, but I might have to sample this one. I did really like Lady Rose Lion (Monkey Unicorn). She does great names in general! I have really liked a few and hope to review some of them soon, but she’s prolific and works in so many styles, by which I mean I don’t like all of them either. But that’s also true of some other indie brands that I have great fondness for. Haven’t tried any yet, but 9 ml bottles = catnip.